liù, liàn huà: Jí rónghuìguàntōng, yě jiùshì bǎ xíng, mǐn, lì, shén, yì, huà liù zì rónghuà wéi yītǐ, liàn zhì jīng chún, bùdú kě suíyì biǎoyǎn, érqiě yìngyòng yùrú. this means that, form, agility, power, spirit, mind intent, and transformation, these six are fused into one. Practice to perfection, then one will not only be able to exhibit it as one wishes, but also apply it effortlessly. As many authors of this period and earlier periods, Yin’s writing follows a classic theme, in this case a common theme in daoist cultivation. That theme involves form, qi, shen and transformation. The first line uses the term wǔ jiàn (舞劍). Wǔ can mean dance, but also means to wield or brandish. 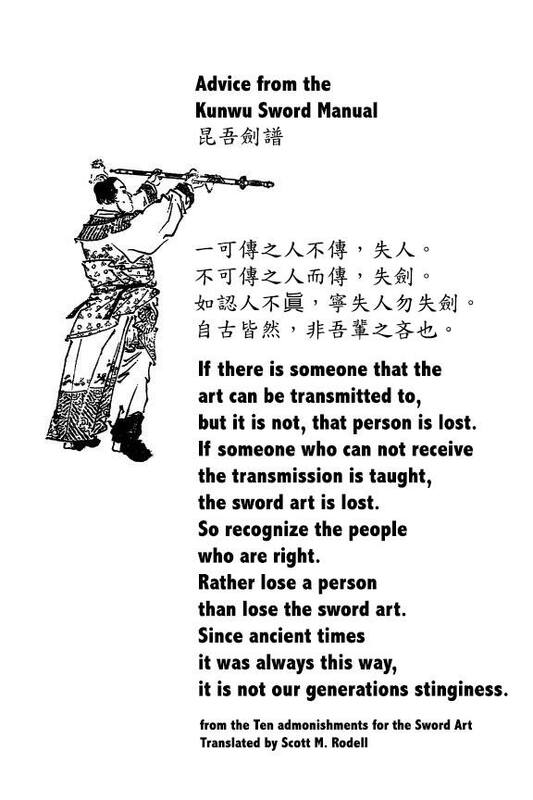 If it were jiàn wǔ, that would be a sword dance where the sword was a being used as part of the dance, not as a weapon. For stage two, the author explains one’s movement should have the quality of Línghuó (靈活). This compound is often translated as nimble or flexible. And certainly it has that mean here. Línghuó, however means more than simply being limber. Línghuó also means that the jianke is able to adapt quickly in a lively fashion. So in this context is it translated as versatile. Concerning power the author uses a compound that is difficult to translate, qìshì (氣勢). Qìshì has the literal meaning of an imposing manner. The problem with that translation in this context is that the jianke trains to exhibit a calm exterior that is devoid of any indication of his or her intent. In plain language, you don’t want the duifang to know what you got. Adopting an “imposing manner” would be quite in conflict with that spirit. The author is however addressing a phase in the swordsman’s training, not the quality of mind in actual free swordplay. When learning how to generate power, how to cut with authority, it might very well be useful for practitioners developing their skills to adopt a powerful presence. Again, as many times in the past, Poney Chang’s input was invaluable. The image of the swordsman is of Dōngfāng Màn Qiàn (東方曼倩) a poet of the Western Han.